Barton James' book DIGITAL MEDIA: A VISUAL ENCYCLOPEDIA provides an excellent survey of 30 categories, project types representing supportive media deliverables, required skill sets in which my leadership and staff must be familiar. My 35+ years TV production and movie directing credits include A-TEAM, WALKER TEXAS RANGER, TOUCHED BY AN ANGEL, and PREDATOR. My partners are KDKA's John Mowod of "Mowod on Movies", son of Tony Mowod from WDUQ's Jazz station fame, and Larry Richert, previous CBS weatherman and Pittsburgh's voice of sports - the STEELERS, PIRATES, PENGUINS." We shot AMAZING RACER at Washington's Meadows Track and surrounding areas. The movie's $4 million budget gathered a handful of local investors, brought to town Claire Forlani, Daryl Hannah, Louis Gossett Jr., and Eric Roberts. The Washington Community Arts and Cultural Center (WashArts) recently expanded it's footprint, held an introductory Gala last December, launched a new facility, offering traditional performing arts, theatrical, painting, drawing, audio, and pottery continuing a decade of successful programs embracing both youth and adults. I proposed a parallel digital arts path, a solid partnership with WashArts through my production company WashFilmPA. While working on TOUCHED BY AN ANGEL, I optioned Dustin "Spanky" Ward's script GENESIS PROJECT, and my distributors recommended that with proper casting, it could generate significant worldwide distribution sales. I recently met with Richard Dreyfus, whom expressed interest in the role as the college professor, and consider talent like Kevin Bacon and Keifer Sutherland as potential co-stars. The screenplay lends itself in comparison to Dead Poet's Society meets Sherlock Homes meets Silence of the Lambs. Ward's script is a rather intelligent, gripping, edge-of-your-seat psychological thriller - not a slasher movie - but definitely a thrill. Washington, PA and The Meadows were used as a backdrop for my latest film AMAZING RACER. My partners in our company are local guys, Larry Richert and John Mowod and local private equity made our film come to life. PA Tax Credits and Section 181 of the Federal Jobs Creation Act played a major role in protecting their investment. Vantage Media International in Los Angeles is distributing my films. 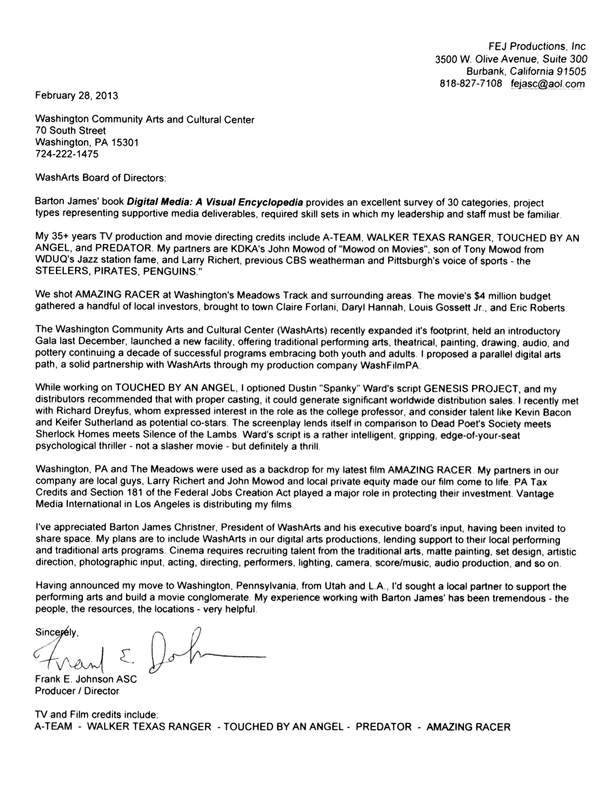 I've appreciated Barton James Christner, President of WashArts and his executive board's input, having been invited to share space. My plans are to include WashArts in our digital arts productions, lending support to their local performing and traditional arts programs. Cinema requires recruiting talent from the traditional arts, matte painting, set design, artistic direction, photographic input, acting, directing, performers, lighting, camera, score/music, audio production, and so on. Having announced my move to Washington, Pennsylvania, from Utah and L.A., I'd sought a local partner to support the performing arts and build a movie conglomerate. My experience working with Barton James' has been tremendous - the people, the resources, the locations - very helpful.